When it comes to breakfast cereals, choosing a healthy option is easier said than done. It is obvious that Americans love cereal; one must simply stroll down to the nearest grocery store to notice entire aisles dedicated to cereals. Cereal is indeed a delicious way to start your day! However, if choosing the wrong kind, you could be compromising your nutritional goals in just one bowl before the day even starts properly. Nutritionists and health experts agree that when it comes to breakfast cereals, the most overdone ingredient is sugar. Most of options on the market have excessive sugar and lack substantial macronutrients needed to start your metabolic processes in the early hours of the day. Fiber and protein are often neglected to make room for ingredients such as high corn fructose syrup and white flour, which deliver a tasty treat instead of a nutrient-packed breakfast. There are exceptions, and thankfully you can find some phenomenal cereals nowadays. However, picking which one is right for you will require a process a bit like a treasure hunt. You’ll need basic knowledge of how to read nutrition labels as well as how to decipher ingredient lists and be ready to spend a good 30 minutes flipping boxes around at the store shelves. The bright colors and big bold letters on the front of the boxes are catchy but hide the actual contents inside. Distinguishing between marketing and evidenced-based claims can be quite tricky. We don’t want to discourage you from finding the perfect breakfast cereal for you and your family, but in the meantime, or occasionally, you could make your own at home! It is surprisingly simple, requiring only 6 ingredients and about 20 minutes in the oven. You will need Once Again Creamy Almond Butter or your favorite Once Again Nut or Seed Butter, a little maple syrup and oat flour. In just one bowl you can mix all ingredients together and you are ready to roll. If you have little helpers hanging around the kitchen with you, let them handle the rolling out of the dough! They are experts in playing with modeling clay and dough after all. Creating long snakes that you can snip to make pillow-shaped cereal is a fun project for all. Not a big breakfast cereal person? Don’t dismiss this recipe so quickly! These Almond Puffs are perfect for snacking too. Just fill up an air tight container and pack it along with you for the day — when hunger strikes, you can munch on it for a satisfyingly and crunchy, nutrient-filled snack that won’t compromise your health goals for the day. Whisk egg, and then mix it into the almond butter. Add in maple syrup and slowly blend in flour. Mix in baking powder and vanilla extract. Roll out dough into long rope and cut ½ inch pieces with a dinner knife. This type of knife will create little pillow shapes versus cylinders. Place them on a baking sheet lined with a silicone mat, or sprayed with non-stick spray and bake for 15 to 20 minutes. Turn them halfway to bake evenly. Store in airtight container for up to one week. Serve with the milk of your choice! 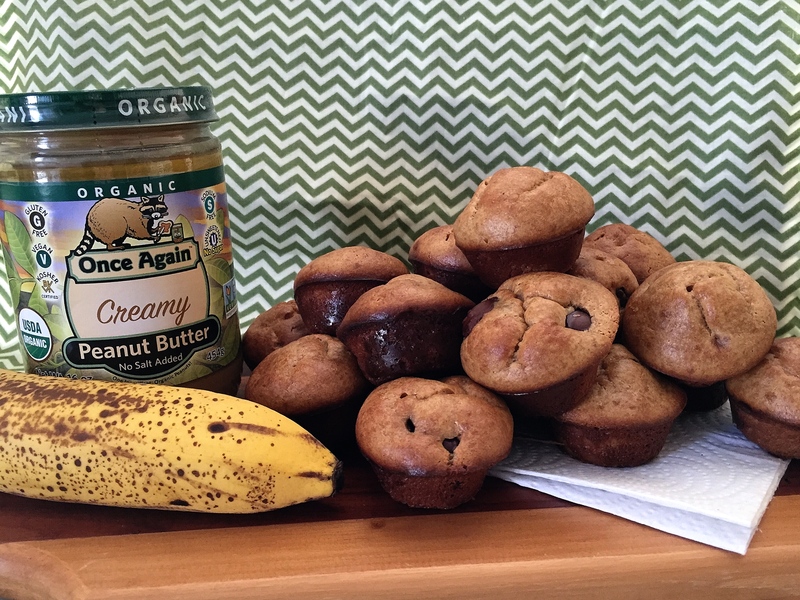 PB and Banana Mini Muffins: Nutrition on the Go! How to make muffins with a blender. I cherish my weekends now more than ever before. During the week it seems that my days never have enough hours and the obligations just pile up. Saturdays when no plans are made until after I wake up are usually the best ones! Time to enjoy a morning cup of coffee while listening to some jazz and taking in the cool breeze of the early hours. Baking has become part of my weekend plans lately. I always enjoyed baking but who has time to do it during the week anymore? I spend some time browsing cookbooks, looking for inspiration from other bakers and find very relaxing to brainstorm about modifications to original recipes that will make it my own or add a twist that fits my style. I gravitate towards recipes with a short list of ingredients as well as ones that can be frozen to eat throughout the week. Most of my adaptations are targeted to simplify while also adding or swapping for nutrient rich ingredients. I have craved a high protein baked good I can eat right before a work out, or as a mid-morning snack to hold me over until lunch time. Since most baked goods have lots of carbs but not enough protein or fiber this has been a bit of a challenge. But with a few trials and twists this recipe is now one of my favorites to make and share with friends too. When people first glance at the ingredients list they usually ask: is this really going to be a baked good? The lack of flour makes you think this may not turn out to be a soft and moist type of muffin. But that is exactly the words I would use to describe this PB & Banana Mini Muffins. They are moist, soft, nutty and sweet in just the perfect amount. Did I mention you use the blender instead of mixer for this one? It is a time saver for sure since you just add all ingredients at once and blend, then you can pour directly into the mini-muffin pan. I also added some chocolate chips to this batch, you could also try it with coconut, raisins, cranberries or just about anything you’d like! I plugged in the ingredients list on a nutrient label program and the estimated protein per mini-muffin is of 4 grams each! They also have 1.5g of fiber and about 70 calories each. Check out the video below! Bake at 350F for about 15 minutes or until golden brown. Serve warm or they freeze well too! … take your nutrition on the go! What’s more refreshing than frozen fruity creations on a stick? The Popsicle has been a long time tradition for summer time! Ends up this delicious creation was the result of an accident by Frank Epperson (at age 11), who claims he left a cup of soda with a stick on the porch on a cold night. He officially introduced the concept in 1923 in California by the name of “Epsicle ice pop” (source: Inventors.com link here). In the United Kingdom and Ireland they call it icy lolly, in Australia it is icy pole and in the United States we know it as Popsicle, frozen pop or ice pop. Even though it has been around for a while and a favorite of most children it has recently graduated to appearing in adult festivities such as weddings, fancy events and chic parties! Grown-ups just didn’t want to let go of this fantastic treat and gave it a makeover to make it worthy of adult functions. The art of “Popsicle crafting” has caught the attention of several chefs, each creating their own version. Food trucks, specialty local shops, fresh food market stands all over the country are serving up gourmet popsicles made with exotic ingredients. Craft Popsicles made with savory spices, unusual combinations and even liquor have revolutionized the concept of frozen fruit on a stick. 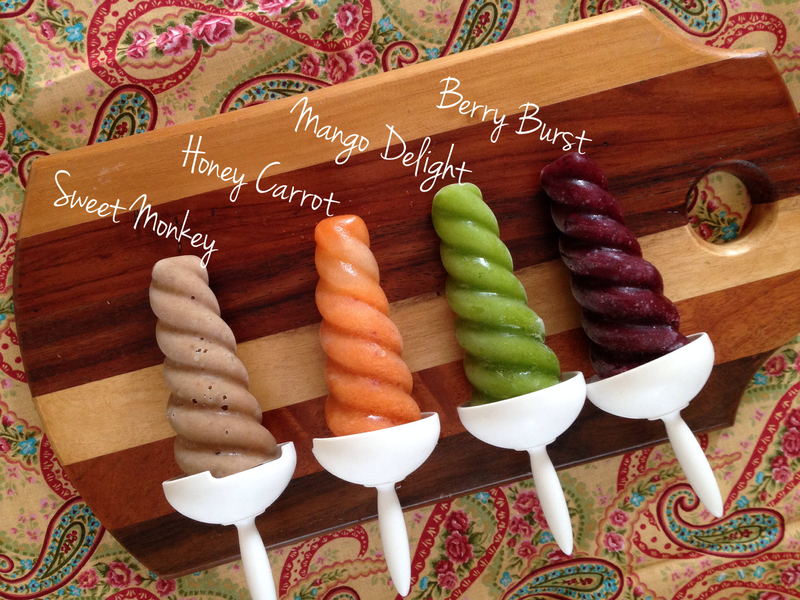 Here is the fun part, it is easy to create your very own fancy Popsicles at home. I recently bought a silicone mold, which in my opinion made all the difference. It is much easier to remove it and you have the option of some fun shapes too. I like mixing some unexpected fruits and vegetables combo which when frozen on a stick just works! My latest creation was the Spinach Mango Delight, simply combine mango chunks, baby spinach leaves, chia seeds and a little water to help blend it. My kids take Popsicle crafting very seriously and like coming up with their own recipes. My son created the “Honey Carrot Pop” which is a blend of carrots, apples and honey while my daughter’s “Sweet Monkey” is made up of Once Again’s Almond Butter with bananas and almond milk. We recently attended a baby shower where popsicles were the center piece, all arranged in different shades of pink announcing the soon arrival of their baby girl. Their main ingredients were berries; just varying the amount of berries to milk gave them a beautiful array of pink colors. (Completely kicking myself for not taking a picture! Sorry!). Go on and create your very own versions this summer, and dare to think outside the box to achieve unexpected flavors that will wake up your taste buds. I wonder if wine popsicles have been explored yet… oh the possibilities!